Zolani: Something isn’t right here, . (Zolani warily looks out over the village below.) 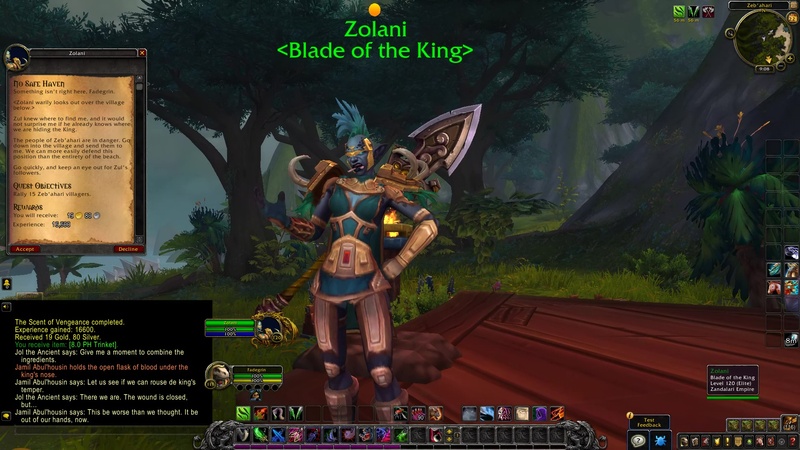 Zul knew where to find me, and it would not surprise me if he already knows where we are hiding the King. The people of Zeb’ahari are in danger. Go down into the village and send them to me. We can more easily defend this position than the entirety of the beach. 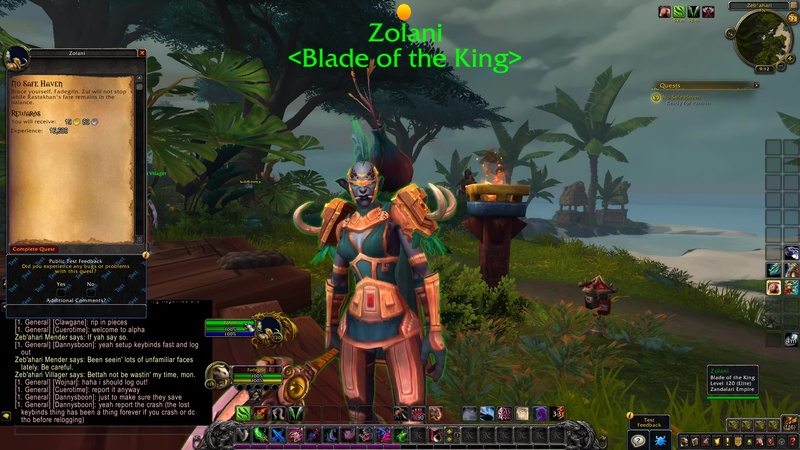 Go quickly, and keep an eye out for Zul’s followers. TIP: The objective is to talk to friendly Zeb’ahari Villager. Some are found on the beach, others at the small peninsula to the east. Zeb’ahari Villager: Be some strange t’ings going on in dis village. Folk sneakin’ about. Ya know anythin’ about dat? Zeb’ahari Villager: If ya say so. Zeb’ahari Villager: I heard sometin’ happened up at deh great pyramid. Any idea what be goin’ on, mon? Zeb’ahari Villager: Don’ have tah tell me twice. Zeb’ahari Villager: So. Our king be dead? Zeb’ahari Villager: Been seein’ lots of unfamiliar faces lately. Be careful. Zeb’ahari Fishermon: Hope ya be comin’ with some news. What happen tah ol’ Rastakhan? Zeb’ahari Fishermon: I got work tah do! Dis bettah be good. Zeb’ahari Fishermon: Who you be? Zeb’ahari Fishermon: Dis no good! Zeb’ahari Fishermon: Bettah not be wastin’ my time, mon. Zeb’ahari Fishermon: Dey be sayin’ Zul deh Prophet be leadin’ us now. Dat true? Zeb’ahari Fishermon: I gettin’ outtah here! Somethin’ bad is comin’! Zolani: Brace yourself, (Name). Zul will not stop while Rastakhan’s fate remains in the balance.